The kettlebell swing is an all-encompassing exercise that not only burns calories, but also offers an efficient way to boost metabolism and burn fat after the workout. In a study published in the Journal of Strength and Conditioning Research, male participants performed 12 rounds of kettlebell swings with a 24-kilogram (53-pound) weight. Each 30-second round was followed by 30 seconds of rest. Participants had their blood drawn before and after the exercise. Their blood work showed that a hormone involved in fat metabolism shot up 18 times its resting level immediately following the exercise—and continued to rise to 21 times its resting level 15 minutes post-exercise. The kettlebell swing particularly works the glutes, hamstrings, abdominals, and latissimus dorsi (a back muscle that attaches the upper arm to the spine and lower ribs), along with the muscles of the shoulder girdle and hand grip. In addition to its fat-burning benefits, it can help extend your posture and even reduce back pain by increasing lumbar (lower back) stability. To determine the right kettlebell weight for your fitness level, you need to consider the nature of the exercise. The swing is a ballistic exercise, which basically means that it is explosive. This type of movement produces varying degrees of tension in the body, transitioning from tight to loose to tight again. Ballistic exercises typically allow you to use heavier weight than grind exercises like a squat or overhead press, which keep the body tension constant throughout the movement. Kettlebells USA, a distributor of kettlebells, recommends a weight of 35–44 pounds for an average active man and 18–26 pounds for an average active woman. Taking the time to prepare your body for the kettlebell swing will help you avoid injury and reap the maximum benefit from proper form and movement. Performing a hip hinge is the first step—it will help you develop a safe deadlift, the movement on which the swing is based. The pendulum swing drill, incorporating the deadlift, is the next challenge. After getting comfortable with these movements, you should be ready for the full kettlebell swing. This sequence is described below. As always, be sure to check with your health care provider before starting a new exercise. 1. Stand tall, with the arches of your feet lined up with the outside of your hips. Engage your buttocks and legs by performing a “corkscrew” action with the heel while maintaining your feet in a firmly planted position. If you have a bar available, you can place it vertically along the spine of your midback, gripping it with one hand on top and one on the bottom (as if you were toweling your back dry after a shower). This will help you feel neutral alignment of the spine. Otherwise, try placing your hands at the front of the hip crease to feel where you are initiating the movement from. 2. Flex at the hips by sending them straight behind you as if you want them to touch a wall. This will help to ensure that you are not squatting to perform the swing. As you do this, keep the back of your pelvis, ribs, and head against the bar. This will help to ensure that you are not flexing or extending at the lower back, rounding forward at the shoulders, or letting the chin jut out. The knees should bend as a result of the hips moving backward; they should not move over the line of the ankles. The angle of the spine at the bottom of the hip hinge should be about 45 degrees with the thighs also at 45 degrees, so that the angle at the hips is 90 degrees. 1. Stand behind the kettlebell and use the hip hinge movement to bend down so you can reach the kettlebell without rounding your spine. Grab the kettlebell strongly with both hands, making sure to keep your upper back engaged, chest open, and shoulders back and down. Rock the kettlebell onto its edge so you can maintain a safe spinal position and still reach the bell. To check if you are in the right position, try letting go of the weight; it should feel like you are about to fall backward. 2. Inhale and pull the kettlebell back between the legs. Remain in the deadlift position and swing the weight forward and backward four times to create the feeling of a pendulum. After the third swing, power from the hips to stand upright, with glutes and abs engaged and the kneecaps pulled up as you swing the kettlebell up to a point between the hips and chest. Exhale sharply to brace the abdominals. 3. Repeat the four pendulum swings, standing up into the full swing, until you get the hang of it. Then decrease the set to three pendulum swings before standing up for the full swing, followed by two pendulum swings, and finally one pendulum swing before standing. At this stage, keep swinging—this is the full kettlebell swing. Once you are comfortable with this movement, you should be ready to take out the pendulum step and go right to the kettlebell swing. 1. Place the kettlebell in front of your feet. Use the deadlift to bend down and grab the bell. Remember to pull it onto its edge so you can grab it safely. 2. 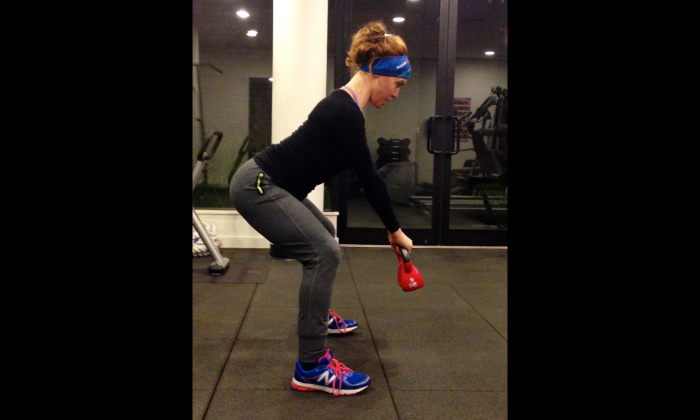 Hike the kettlebell back on an inhalation and then use the power of the hips to swing the bell up to shoulder height. Keep the torso vertical as long as possible. You should feel the weight “float” for a moment, indicating a period of loose tension. 3. Pull the bell back down as hard and fast as you can toward the lower abdominal area. At the last moment, break at the hips so the kettlebell moves between your thighs. Keep the weight close to your body and do not let it go below your knees, as that will place too much stress on the lower back. Make sure to keep generating power for the swing from the hips, moving forward and up and then down and back. Most importantly, breathe in coordination with the movement as described above.